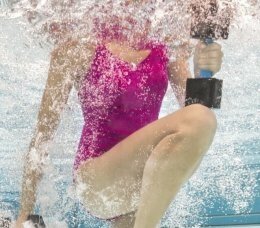 Adding targeted exercises into your water workout is a great way to tone your arms. Sure many cardio movements help to tone your body, but surprisingly those movements do not tone all of your arm muscles. In part two of our exercise series, we are going to focus on all things arms. Here are a few new arm exercises to add to your water fitness regimen today! This exercise is just what it sounds like, but instead of doing a push up on the ground, you use the side of the pool! This exercise should be done in chest high water. Stand facing the side of the pool with your arms outstretched in front of you holding on to the side of the pool. Standing on the pool floor, your feet should be together. Bend your arms outward to allow your body to move in closer to the wall, and then push out making your arms straight. Do these as many times as you can. This exercise requires a ball that will float in the water. The bigger the ball, the more difficult this exercise will be. This exercise should be done in chest high water. With your feet flat on the pool floor, grasp the ball with both hands and while keeping hold of the ball push it under water. Maintain control of the ball while it is underwater, holding on to it firmly and moving it from side to side, or making figure eights. Do this for 30 seconds at a time, slowly bring the ball to the surface, rest for 30 seconds and repeat three times. Please use caution when attempting this exercise. This exercise should be done in waist high water. With your back facing the side of the pool, place your hands on the pool ledge, fingers facing the inside of the pool. With your arms bent, push your body up out of the water and in the process straighten your arms, and then lower your body back down into the pool slowly. Do this 10 times. Then turn around and do this exercise again, this time with your front facing the side of the pool and hands on the pool ledge fingers facing the outside of the pool. Do this 10 times as well. This exercise should be done in shoulder high water. With ample room around you pretend that you are boxng a punching bag under the water. Do this movement using different boxing moves, keeping your arms completely under the water. Do this for as long as you can. To add difficulty to this exercise, you can do this with an open hand to provide more resistance. *As with any new exercises, please check with your doctor before attempting to do these exercises.